These little glass bells are a replacement part and are used with pyramids PG002 and PGF002 produced by the firm Blank. These Christmas Pyramids display 7 angels and four glass bells, both in natural and painted finishes. The glass bells hang within these Blank Angel pyramids including this PG002 7 Angel Pyramid. Click on Link to see details of pyramid. 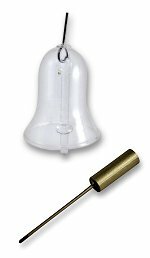 Each bell measures 1-3/4 x 1 inch and includes clapper and metal hook. We also offer the Metal Striker that hits the clapper extension as the center rotates. Please use drop down options - Items sold separately. We now also stock and sell this pyramid as well as replacement blades and replacement Angels! These fence post sections were designed for many of the Richard Glässer Pyramids but they may also fit and work with other brands. (Series 137 and 167 Pyramids by Glässer) A complete fence is made of fence, posts and finishing caps. (Fence sections may be ordered separately - lengths vary) Made in Germany by RG Erzgebirgische Volkskunst Richard Glässer GmbH Seiffen Fence post: 25,0 mm in height, 17 mm in width Post Cap: 11,0 mm in diameter Each sold separately...use drop-down menu!